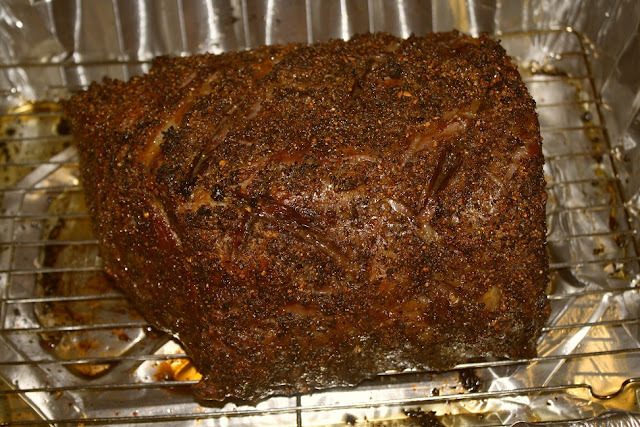 Per my last post, our Christmas dinner guest list was primarily friends, but son, Rhett, and his family came over from South Carolina on the 26th for a holiday visit and his meal request was for smoked beef rib roast (prime rib). Since this is one of my favorite meals, I was only too happy to accommodate his desire. Kroger's had their bone-on, choice, rib roast on sale for $6.99/lb earlier so we bought a four bone roast and let it hang out in the fridge for a week before cooking - the butcher had cut off the bones and tied them back on. I didn’t have any of my special prime rib rub and since we have enjoyed Montreal Steak Seasoning on our steaks I decided to give it a try on the roast. I didn’t want to cook it with the bones as it might affect how it cooked and they would need to be removed for the crust adding process to get it around the entire roast. So I removed the curved bones, flipped them the opposite direction, and laid the curved side of the roast back on them, thereby creating a space between the bones and the meat. 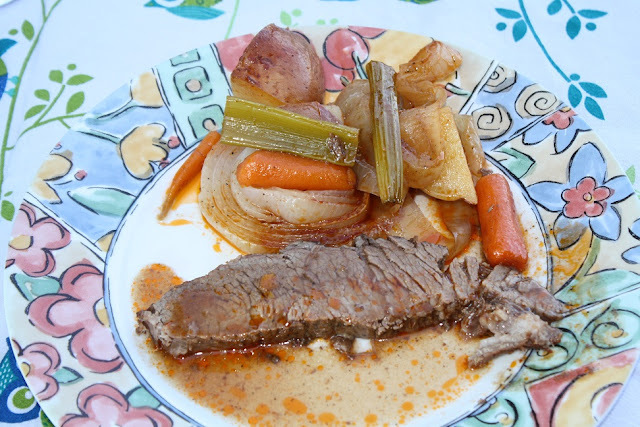 I cooked it in the smoker at 225F to an internal temperature of 120F, then wrapped the roast in foil and placed in a pre-warmed cooler to rest until dinner time and the rib meat became a little appetizer - then the bones were simmered overnight for rich beef broth. Fifteen minutes before meal time, the roast was unwrapped, placed on a rack in a pan and put into a 475F oven for 10 minutes and came out looking like this. 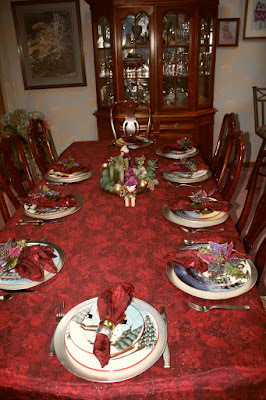 As we often do, we invited a few folks over for Christmas dinner that we knew had no other plans so we ended up with nine to dine at Bev’s pretty table. Following is our Christmas Newsletter that hits the highlights of our year. Thanks again for stopping by Almost Heaven South so we can mutually share a little piece of our lives with each other. Holiday greetings to our family and friends, we hope you’ve had a great year and here is a little about ours. We’ve had quite a busy year in 2016. We are always happy to report that things continue to go well for our children and are pretty much the same as last year with them being in the same locations and jobs, except Wende has entered politics and is a member of the Oak Ridge Beer Board and made a run for city council. Kathy and the girls came in for a visit in late June and Eric and family were here in early July – we always we look forward to seeing them. Rhett and Beth have bought a travel trailer and now he can return to something he did a lot of in his childhood. The grandkids continue to grow up way too fast – driving, dating, and about to graduate high school. 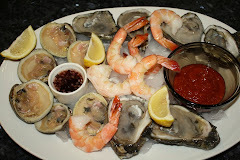 We did quite a bit of RVing beginning with a couple of weeks in January (between knee replacements) in Cajun country near Lafayette, LA, where we ate lots of great food and got familiar with the area. After Larry’s second successful knee replacement, we went to the Callaway Gardens, GA area and Stone Mountain, GA for a 10 day, two-stop rally with our RV club, then went directly to Sevierville, TN for another five day rally with the Thor Diesel Club and we had a fine time at all three stops and with both groups. 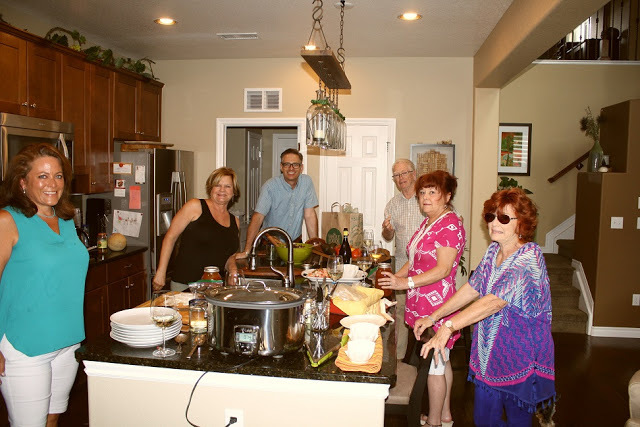 Then on July 20 we headed out for a 68 day trip to Colorado and New Mexico where we made stops in Kansas City and Denver to visit with friends before heading to our primary destinations in the Rocky Mountain high country. Larry’s main goal for the trip was to get away from the heat and humidity of home and we were not disappointed as we had temps in the mid 70’s and humidity in the 20% verses the 90’s at home. We spent about 10 days each at four CO stops and another 10 days in Santa Fe, NM and when we got home, all decided that about two weeks shorter would make for a better trip. 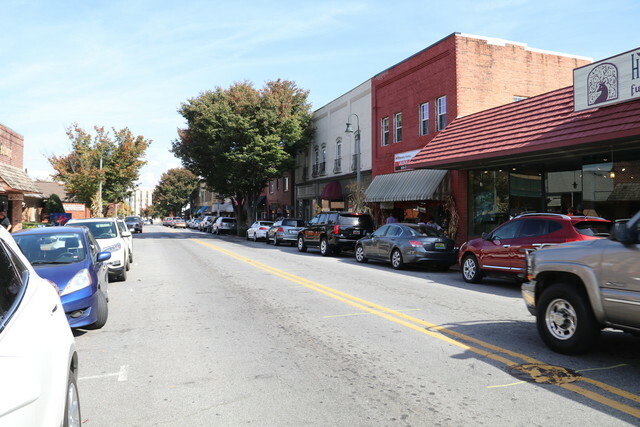 We were home for about three weeks then went off to Maggie Valley, NC for a week where we hosted a fun rally for our RV club and this ended our RVing for the year – but not the traveling, at least for Beverly. She, Pat and some friends spent the last two weeks of November, including Thanksgiving, at our time share on the beach at Marco Island, FL, then they came home for five days and headed off to the Caribbean Island of St. Maarten for two weeks (they had postponed their normal spring trip due to Larry’s knee replacement). Obviously Beverly has been really on the go this year and looking forward to just relaxing over the holidays. We had another significant change in living arrangements here at Almost Heaven South when previous house sitter and now good friend Cindy moved into our downstairs – you might say we now have a full time house sitter, but she has really become a member of the family. On the medical front we continue to be okay but after having both knees replaced, Larry still had a toe problem which caused pain when he walked and this was corrected in late October and resulted in a left foot boot for six weeks. Now that he has recovered from his knee and toe surgeries and is nearly a bionic man, other than a few minor issues, we continue to experience pretty good health and we are enjoying our blessed life. On a sad note, we lost both of our little four legged girls and the grieving was pretty hard on us. 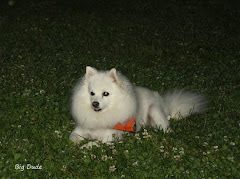 Thirteen year old Sweetie Pie died early summer and eight year old Coco died in November while Bev was in Florida. Her mothering gene is alive and well and she’s on the hunt for a replacement. That’s all to report from our part of the world and our wish for you is a Very Merry Christmas and a Wonderful New Year. My good buddy Joe knows I’m once again dog sitting and bachin-it so on Friday he said he would plan to come over on Sunday, which sounded great to me. Later that evening he called back to offer a different plan – he and Carol would both come over and bring steaks and salad – for some reason they think I’m a good steak cooker but I don’t think so. At Carol’s request, my contribution to the meal was to be twice baked potatoes, which is one of my favorites and I was happy to do. I used the Pioneer Woman’s recipe but didn’t follow it too closely. 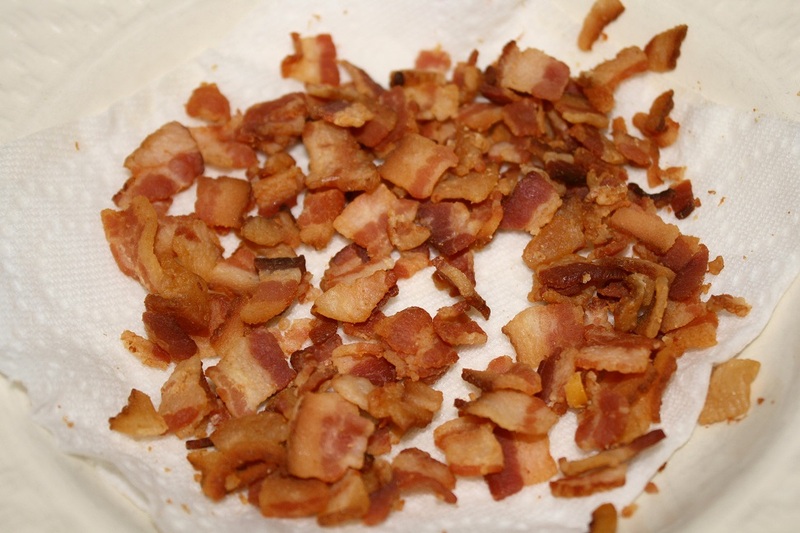 Larry note 1: Since I didn’t want to trash the cooktop, I diced a pound of bacon into 1/2 “ pieces and cooked them over low heat in a high sided sauce pan until nicely brown. It takes a while to render enough fat but once the pieces are all submerged, they quickly become a nice crispy golden brown. Then I removed them with a slotted spoon, drained on paper towels, measured out the needed one cup, and saved the rest. 2. Place the potatoes on a baking sheet. Rub them with the canola oil and bake for 1 hour, making sure they're sufficiently cooked through. 3. Slice the butter into pats. Place in a large mixing bowl and add the bacon bits and sour cream. Remove the potatoes from the oven. Lower the heat to 350 degrees F.
6. Fill the potato shells with the filling. I like to fill the shells so they look abundant and heaping. Larry note 2: When my mom made these she did not oil the potatoes and the skins were always crispy and hard to damage, but the oil keeps them pretty tender. You real cooks likely already know this, but I found that if I went around the potato flesh with the slanted point of the knife, it made the potato scoop out easier and left just the amount of potato I wanted on the inside. No, I haven't quit blogging, I just haven't had much to write about for a few weeks. It was time to think about supper (about five minutes after breakfast) and Bev suggested some beef short ribs that were in the freezer and needed to be used. I thought I had saved a recipe for them and sure enough, I found one from Pam at For The Love Of Cooking. Rather than recopy it here, please check her site for the recipe and pics. 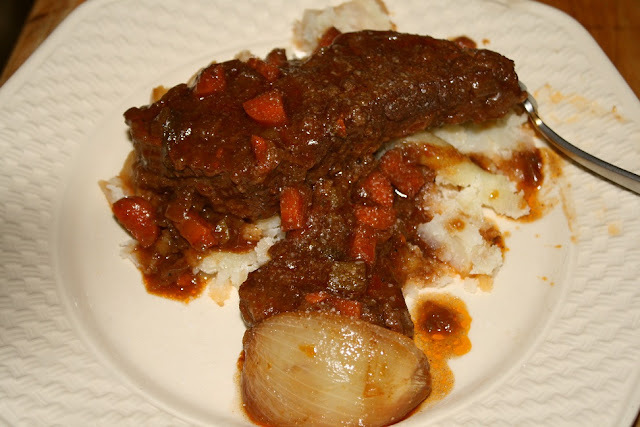 Ingredient wise, I made it by the recipe except I had only six short ribs or so the package said but I have never seen boneless short ribs. My guess is they were similar to pork country ribs which are boneless and cut from the shoulder or in the case of beef, from the chuck. I made the dish per the recipe except I did not strain or blend up the sauce – just left it chunky and pulled out the bay leaf and any thyme stems I could find. Rather than baste them half way through the cooking process I just flipped them and at this time, I also added two quartered onions and four potatoes in large chunks. To serve, we used a fork to mash some potatoes on our plates then topped with some sauce, the meat, and more sauce. Not much of a presentation or shot (we were hungry) but we all thought this was one of the best meals we have ever cooked and as a bonus, it was made in one pot. It will definitely be made here again – thanks Pam for a delicious supper. The primary reason I wanted to make this summer trip was to go into Rocky Mountain high country for some relief from the east Tennessee summer heat and humidity and as it turned out it was above 90 degrees nearly every day while we were gone. We ended up spending from Aug 10 through Sep 19 in areas where the temps would occasionally creep above 80 and it was between 45-55 at night and as a bonus the humidity was also low. On the way to the high country we got to visit with friends in Kansas City and Denver which is always a highlight of our trips. From Amarillo, we continued on I-40 to Oklahoma City and I was surprised as I thought the drive would be through a pretty brown county side but if I didn’t know better, I would have believed we were in the non-mountainous areas of east Tennessee. We past several wind farms along the way but one to the west of Amarillo ran for 34 miles. 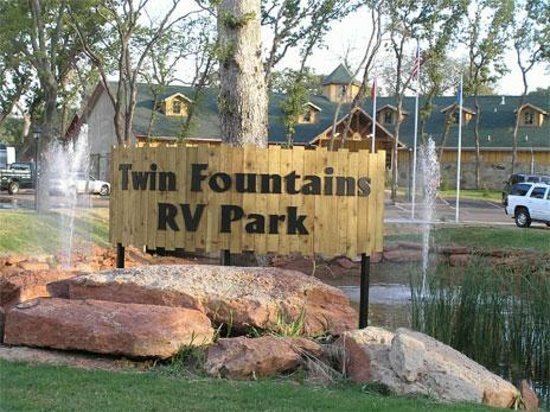 Based upon a recommendation from a fellow camper and good reviews, we opted to stay on the NE side of town at Twin Fountains RV Park. It was a pretty nice park and I can see it being a destination place. Some of the sites were pretty tight and I never could get the wi-fi to work. Twin Fountains is an RV Park on it’s way to becoming a resort. 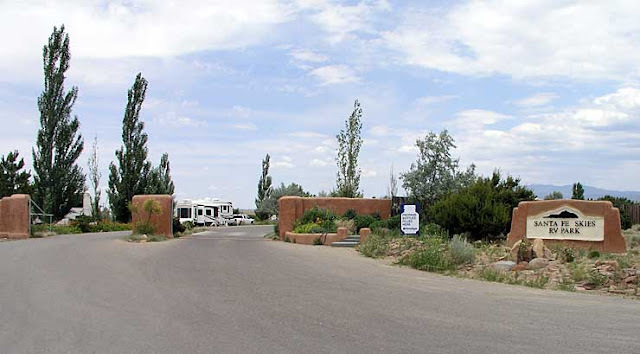 We left Santa Fe on Tuesday starting our trip home but first I’ll discuss Santa Fe Skies RV Park. 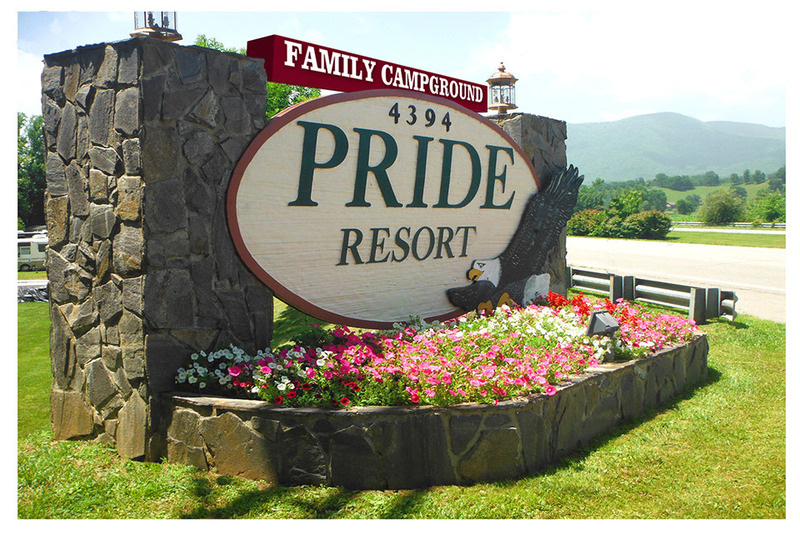 We really liked the park and would consider it the high end of the mid range between a campground and a resort. Here are some shots of the park and our nice site – we liked that we had a patio on both side with the drivers side facing west for sunset watching. We didn’t do much on Sunday making the decision to wait until Monday for a trolley tour around town rather than fight the weekend crowd. So we headed down to the Loretto Chapel area only to find that apparently everyone else had done the same thing and the noon and 12:30 tours were sold out but we could buy tickets for the 2pm tour. Since the Chapel was on my list, we went in for a visit – the engineer in me wanted to see the famous staircase. As the story goes: when the chapel was completed in 1878 there was no access to the choir loft 22 feet above the rear of the building and carpenters called to look at the problem concluded that a ladder would be the best solution. On Friday we finally went south a few miles for brunch at the San Marcos Café and Feed Store – yep, you read correctly as the business was first a feed store then the café opened. It recently changed hands and the new owners are committed to maintaining what has worked well for over 30 years. After returning from Taos the first time, doing some web research, then visiting the farmers market, Bev decided there were three things she wanted to see – the Purple Adobe Lavender Farm, the Rio Grande Gorge Bridge, and the Taos Pueblo. Since I still had the cough and didn’t want to be with other people much and we could see them all in one big loop, we decided it would make for a good day trip. We began by heading up to Abiquiu (yet another unpronouncable word for me) to visit the lavender farm located down a yellow lined dirt road. 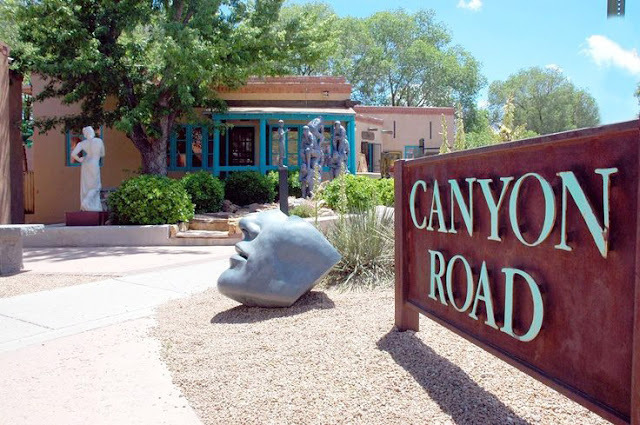 On Monday we just drove around town a little, making sure we could get to the plaza, and we drove out Canyon Road where many galleries are located – it was a typical narrow road lined with adobe structures. After that we drove north to the Santa Fe Opera but it was all closed up so it was back home to relax and have dinner. On Tuesday, we went to the farmers market, picked up a few things and made sure we knew our way around in preparation for a return on Saturday, which is supposed to be a zoo. The day after a six hour drive and setting up camp, I usually just want to hang around Sweetie and relax and since it was football Saturday, that made it easy. There weren’t really any games on early that interested me so we drove into Santa Fe to see where the farmers market was located and pick up some groceries. The campground owner advised that this was Santa Fe Fiesta weekend and the plaza area would be packed so we decided to wait until it was over to visit that area. On Sunday, the weather forecast was for warm and sunny so we decided it would be a good day to head up into the mountains for a visit to Taos and the ski valley. 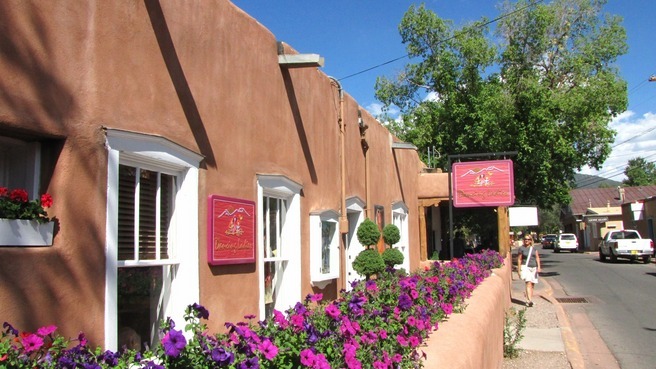 Sometime back in the 90’s we came to Taos for a week of skiing and looked forward to a summertime re-visit and Mexican lunch. I began our last day in BV by getting a shot of a patch of Aspens changing color on the mountain across the road from us. They are supposed to peak next week so we’ll miss them but got to see them in all their glory the last two trips to Colorado. The last time we were in Buena Vista the girls went up (2200’) to Leadville and I did not go so I didn’t want to miss the trip this time, but we started the day on the patio of the Evergreen Café in Buena Vista for breakfast. I didn’t get any food shots but everything was very good and at a decent price. Even though it was a holiday weekend, we decided to make the drive up to the ghost town of St Elmo and as expected many others had decided to do the same thing – lots of traffic on the road and little to no parking when we got there. Rather than do a big write up, I’ll just post a few of our thoughts and comments and refer you to Trekking With The B’s who just made a great post with lots of pics on the same trip we took but without the throngs of people. 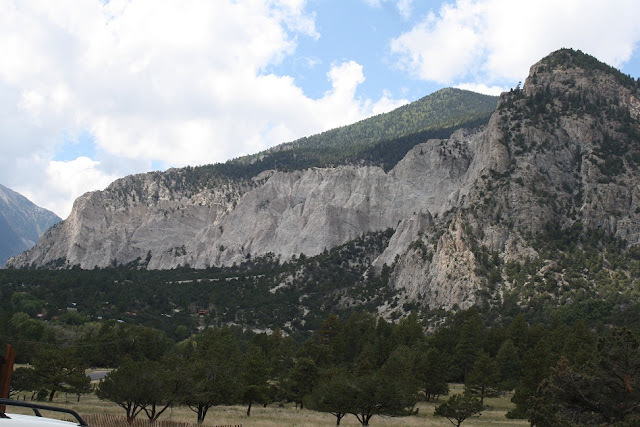 These are the white “chalk” cliffs at the base of Mt Princeton followed by a look approaching St Elmo. 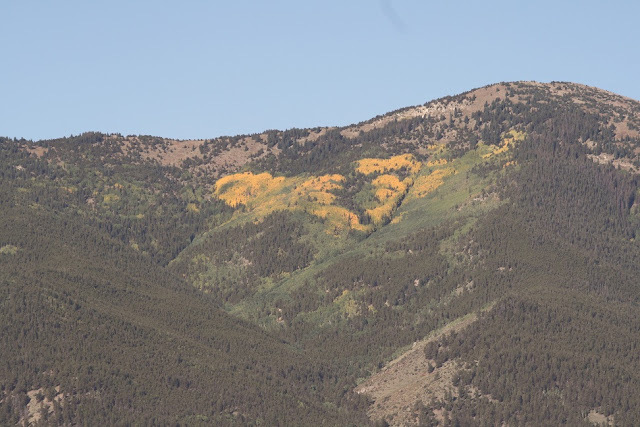 September first was moving day so we packed up and departed Gunnison around 11am and headed east to Buena Vista, located about 85 miles away but just across the Central Sawatch Range from Gunnison – about 60 miles as the crow flies. 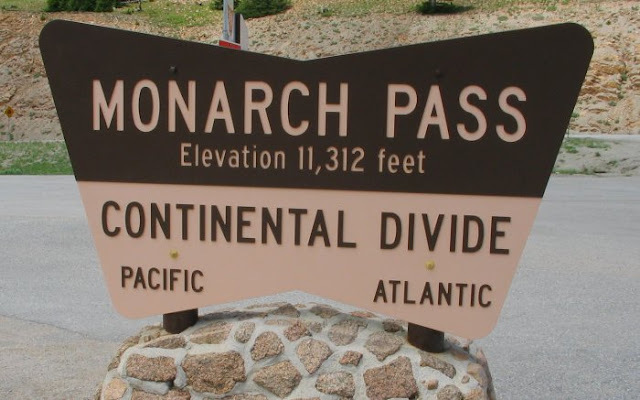 The drive was uneventful but crossing Monarch Pass required my undivided attention as the 7 mile upgrade and 10 mile downgrade was on a very curvy 6% grade with very few guardrails. I put Sweetie in 3rd gear and she made the climb at a respectable 35-40 mph to the 11,312 foot pass. Mesa Campground is located about three miles west of Gunnison on US-50 and we had booked 11 nights so we would have 10 full days in the area. 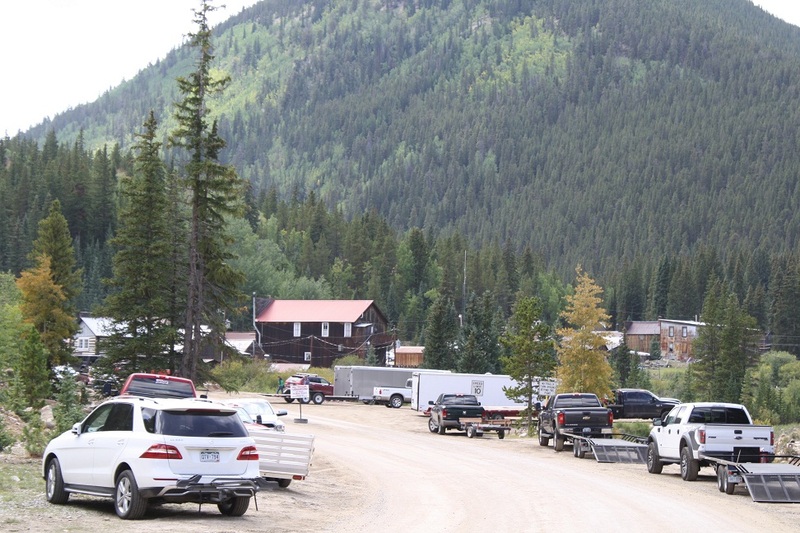 It bills itself as the nicest campground in the area and has spaces for everything from tents to big rigs. The trailers in the fourth shot are privately owned. The final thing on my Gunnison to-do list was make a day trip down to Lake City and, based upon our Montrose neighbors recommendations, eat at Southern Vittles – it seemed like a good trip for our next to last day. The drive down was mostly through the vast western Colorado hilly desert with the lush green of the irrigated valleys. 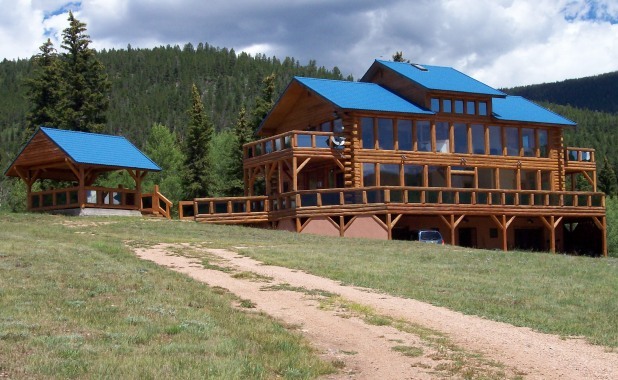 It’s about 50 miles from the campground with little civilization once you turn off of US-50 and on to CO-149. The road was in decent shape and while there were no mountains, there were some big hills to cross (mtns. back in TN) and plenty of curves. We saw several coaches and trailers on the road, but I’d have to want to camp in Lake City really bad to drive Sweetie there. After a quick tour of town, we drove up to Lake San Cristobal and after taking a few photos we began looking for the dam and were surprised to see the water going over the top. After researching, I discovered that it is the second largest natural lake in the state having been formed by a rock slide about 700 years ago – so no man made dam was there. When I got ready to upload my photos, I discovered my SIM card was still in the computer so no shots to upload – here are a couple of the lake, which is gorgeous, from the web. 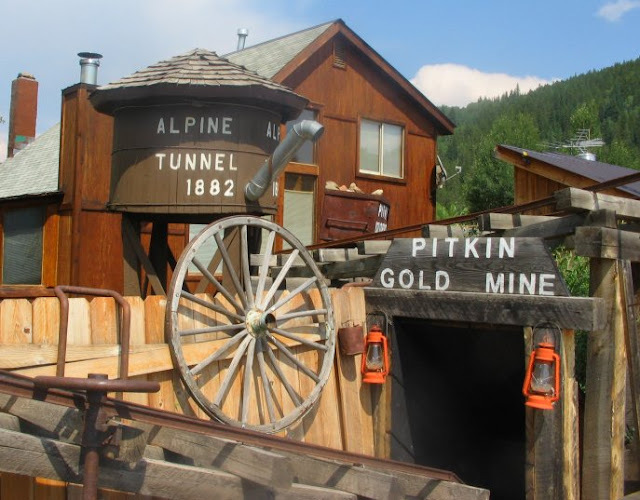 On Saturday, the girls went to the farmers market in Gunnison then we went for a drive up to Pitkin - founded in 1879, and is said to be Colorado's first mining camp west of the Continental Divide. Unlike Tin Cup, which has mostly original buildings, Pitkin is more of a modern residential town (full time and seasonal) with a few of the older buildings - I can see why folks would want a summer home there. 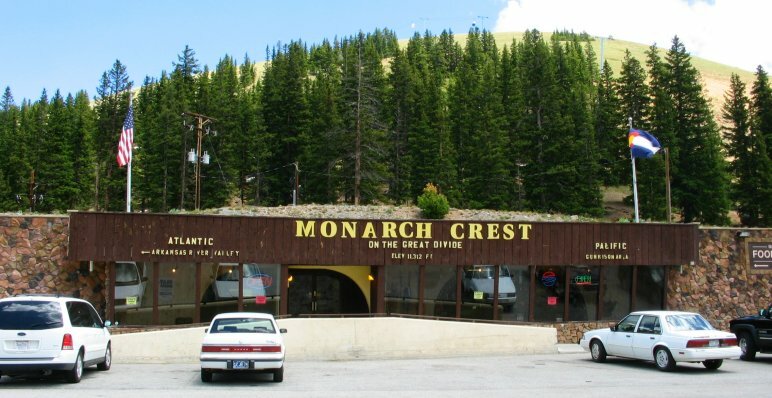 It is located at the end of another pretty valley and since it's 1000 feet lower it wasn't as cold as Tin Cup. The next day, we hung around the coach and made Cajun alfredo pasta using Mary's recipe for Shrimp Fettuccini Alfredo at Deep South Dish. Check out her site for the recipe and lots of pics. The one change we made was adding a half slice of diced country ham with the shrimp. It was very good with plenty of Cajun flavor (even though it didn't look like a lot of spices before I added the shrimp to them). 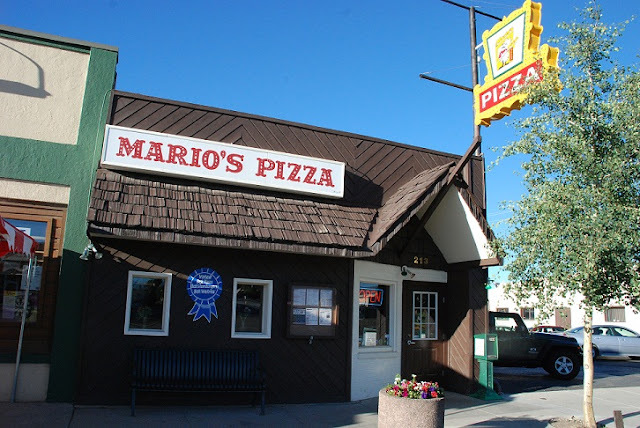 On Monday, the girls finally made it up to Crested Butte for a little shopping while I dog sat then we got take out from Mario's Pizza and Pasta. I thought my Stromboli was very good for a small town in the CO mountains and the girls enjoyed theirs as well. It's really slow and almost painful, but I can post. It appears that we attract rain and road pavers here in Colorado – the road between the campground and town has undergone repaving in Grand Junction, Montrose, and now in Gunnison. As for the rain, a cold front has moved through and we had rain for two days which I’m sure the area always needs but since it has likely turned the dirt roads we planned to travel into mud, we decided to wait a day – the girls headed to Gunnison to check out the shopping while I dog sat and puttered around the coach. The next day, we decided to make a drive into the mountains and opted for Taylor Park and Tin Cup. 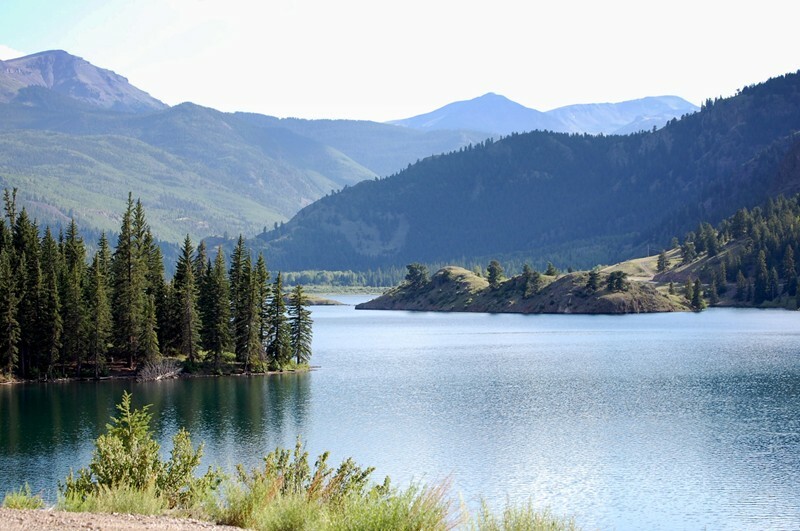 Taylor Park is the developed area around Taylor Reservoir and is about 35 miles northeast of Gunnison with the pretty drive up the Gunnison and Taylor Rivers on a paved road. If you followed along during this summers Colorado trip, you may recall my computer crashed so I was missing some posts that I had already writtren up. My buddy Joe has recoved the info from the old computer hard drive and I wanted to go ahead and post these for documentation sake - I'll leave them up for a couple of days then put them back in the correct order - this is last of three. 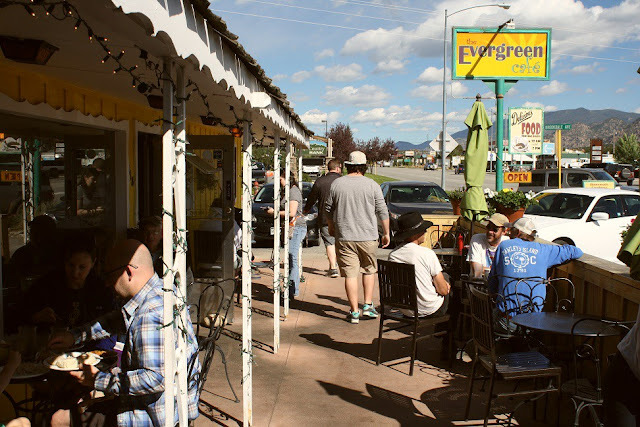 Our first full day in Gunnison was devoted to relaxing and going out for a late breakfast at the W Café on Main Street – breakfast served all day. Bev had the breakfast burrito which was pretty tasty but not warm enough. If you followed along during this summers Colorado trip, you may recall my computer crashed so I was missing some posts that I had already writtren up. My buddy Joe has recoved the info from the old computer hard drive and I wanted to go ahead and post these for documentation sake - I'll leave them up for a couple of days then put them back in the correct order - this is second of three. Our last day in Montrose was a beautiful, clear 83F and it was devoted to a few last minute things and getting ready to leave on Sunday. Everything outside needed to be wiped off to remove the dust in preparation of stowing – I don’t want to take much of it home and it’s the one thing I don’t like about the western states – there is a thin layer on the inside as well. We brought a brisket from home and decided we needed to make room in the freezer for stuff to take back home and I decided to just cook it in the oven using a recipe from Ina Garten. I followed the recipe except I added a few potatoes as well and I didn’t use as much juice as my pan was just a little bigger than the roast. The meal was delicious and I will definitely cook brisket this way again. If you followed along during this summers Colorado trip, you may recall my computer crashed so I was missing some posts that I had already writtren up. My buddy Joe has recoved the info from the old computer hard drive and I wanted to go ahead and post these for documentation sake - I'll leave them up for a couple of days then put them back in the correct order - this is first of three. 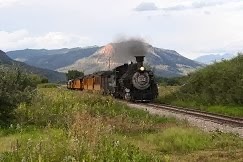 For our final three days in the Montrose area, we had two things on the agenda – visit Telluride and go to Paonia for some Big B’s Hard Cider and based upon the weather, we opted to do the later on Thursday. 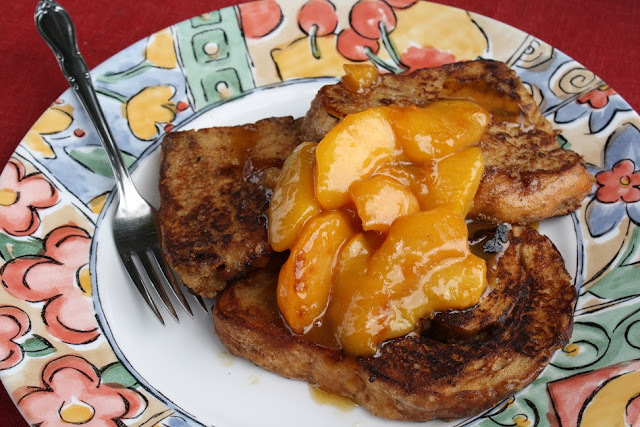 But before we headed out we fixed a little something for breakfast – French Toast made with cinnamon bread from a local bakery, fried in butter, and topped with some local peaches that were cooked in brown sugar and butter to make a peachy sauce. What a delicious way to start our day. My computer has crashed - I don't think it likes to travel as it often has an issue when we're on extended trips. This is coming to you from my small emergency back-up computer which is pretty much just a kiosk for the internet but might be receptive to uploading photos. If so, I'll continue to document our trip beginning now but there will be a time gap as the photos after the jeep trip post are on the other computer. After a day of jeeping we decided to stay close to home on Tuesday and run a few errands including a stop at a local meat processor that had been recommended by our campground neighbors. Kinikin Processing is just that, a meat processing plant that also has a retail component where they sell fresh cut beef, pork, and lamb along with some finished products such as jerky and summer sausage. We ended up buying beef and elk summer sausage, bacon, bacon hamburger, and some dog burgers for our four legged guys. I would like to have bought some steaks but $20/pound for T-bone is more than I was willing to pay – but I may have to go back just to try some. 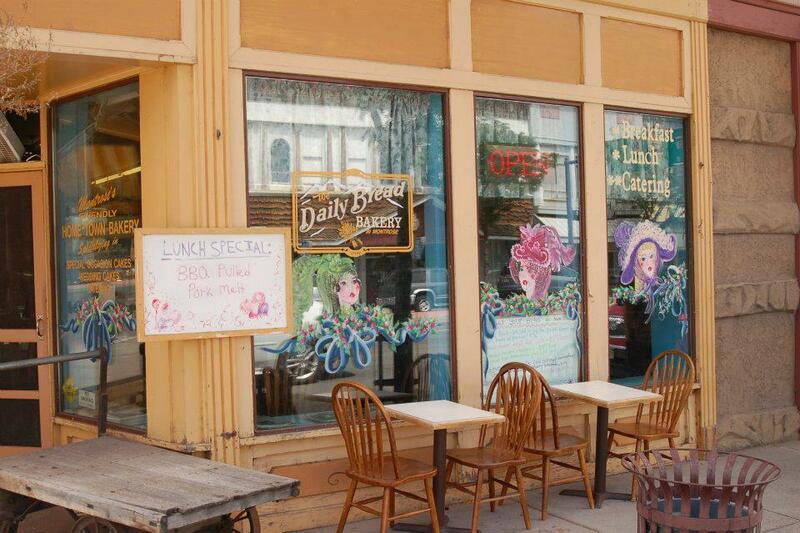 From there we went down on Main Street to the Daily Bread Bakery and Café. We got there pretty late in the day so the pickins were pretty slim, but we did buy a loaf of cinnamon bread and a loaf of sour dough. The plan was to drive over to Telluride on Wednesday but with a 70% chance of rain there, we decided to once again stay close and the girls went shopping while I dog sat, peeled shrimp for pickling, and made supper – some days I like to just not go anywhere. 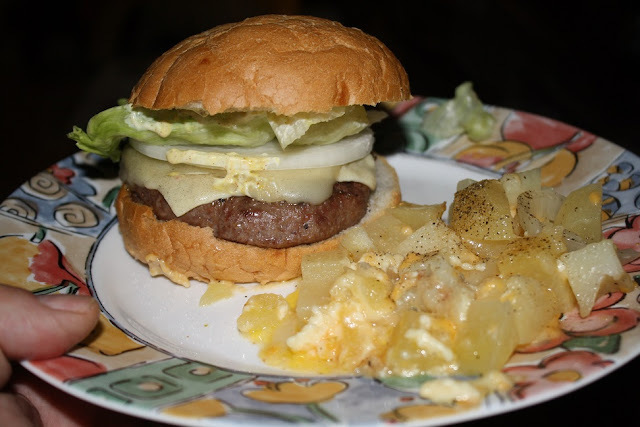 For supper, we opted for the burgers from Kinikin and some cheesy potatoes, and onions in foil cooked on the Jumbo Joe charcoal grill - delicious. I had mentioned earlier that the campground has buddy sites and the neighbors we were sharing the green space with were very experienced jeepers and went out about every other day. They live in Farmington, NM (one day’s drive from here) and they come up here for a month each year, meet up with some friends, and ride trails. After the ladies mentioned they would like to see what off-roading was all about, we asked Mike and Kathy if we could rent a jeep and tag along on one of their rides. They offered to go one better and make a trip with just them and us, promising to take us places that would not scare my girls too badly. So we checked the weather and found Monday would have the least chance of rain, made a reservation with Switzerland Of America for a 4-door, Jeep Rubicon with an automatic transmission ($220), and we were set to go. We left the campground at 8am, picked up the jeep and were heading up the mountain by 9am. 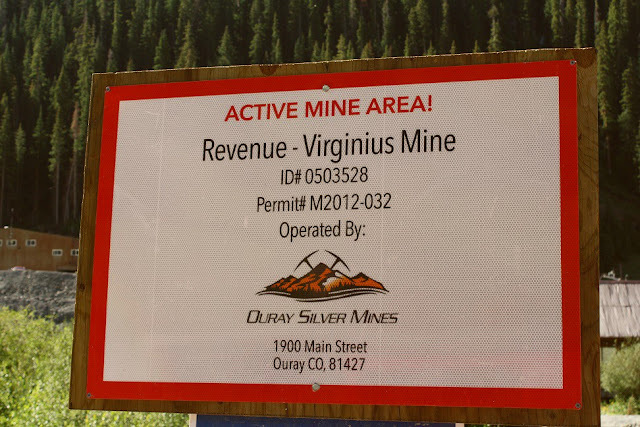 We began on a decent county gravel road called Camp Bird Rd and we were surprised at the amount of traffic on it – both off-roaders and commercial – and when we came across a mine then the road split and we headed up Yankee Boy Basin Rd to discover the obviously operating Revenue-Virgunius Mine, so we understood the non-off roader traffic. On Friday, we decided to take it pretty easy so we just made the 20 mile drive over to the Black Canyon of the Gunnison National Park (this is 18 of 60 National Parks we have visited - all four in Colorado - so we have a few to go). The canyon's name owes itself to the fact that parts of the gorge only receive 33 minutes of sunlight a day and the park encompasses 12 miles of the 48 mile long Gunnison River Gorge. 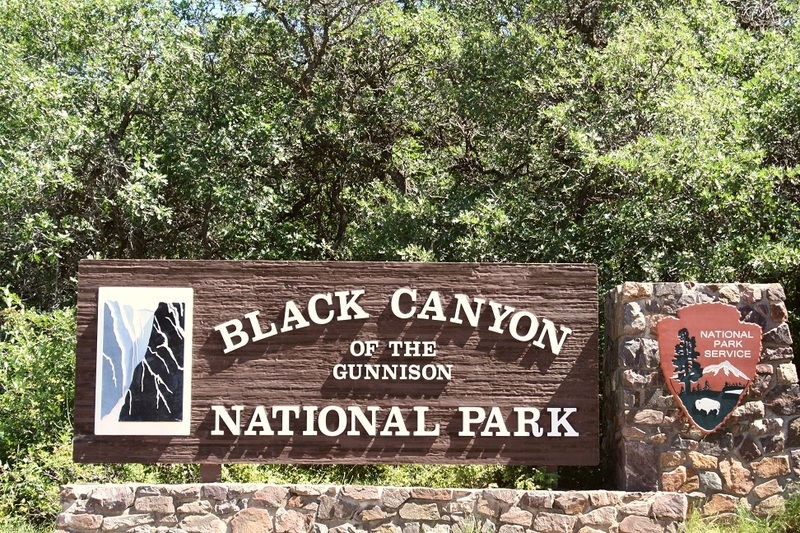 A quote from a book on the canyon - "Several canyons of the American West are longer and some are deeper, but none combines the depth, sheerness, narrowness, darkness, and dread of the Black Canyon." From the 5800’ elevation of the Montrose, we had to climb up about 2500’ to the canyon rim – our car got a little hot on the ascent and the air temp dropped about 10F. 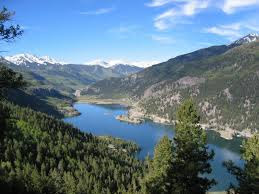 Per Wikipedia, the Gunnison River drops an average of 34 feet per mile through the entire canyon, making it the 5th steepest mountain descent in North America and by comparison, the Colorado River drops an average of 7.5 feet per mile through the Grand Canyon. We just drove as far as the visitor’s center and walked down to the overlook for these shots . My shots don't do the canyon justice.